Please excuse the pun – it’s just that I’m always looking for ways to make grilled chicken a little more exciting (who isn’t? ), and sometimes an intriguing title or analogy helps entice the family into trying an “exciting” new dish. (This is marketing at its best.) 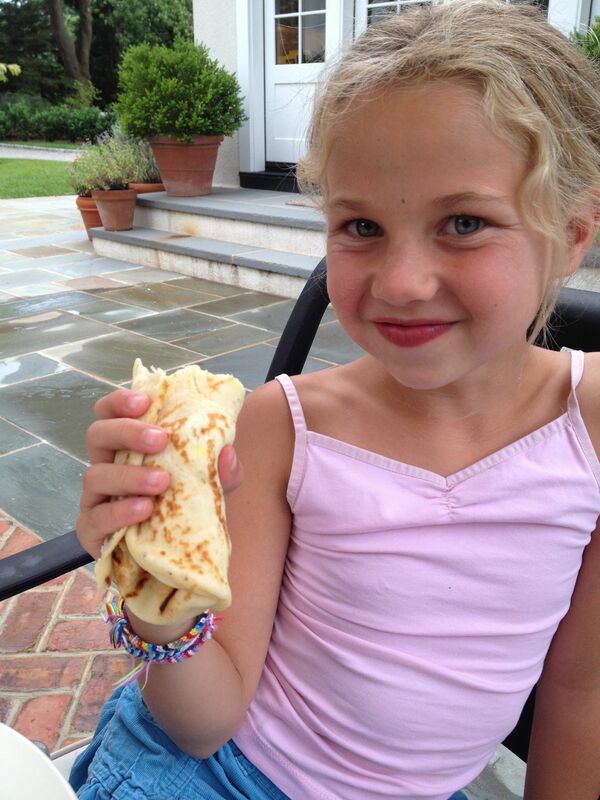 My clan might not be ready to embark on the culinary voyage of “Chicken Souvlaki with Coriander, Turmeric and Mint”, but call something a taco and they’ll be pulling out their Premier cards for early boarding privileges. Since this recipe can take you on a sensory journey to exotic, faraway lands, I was tempted to dub it “Marco Pollo”. (Get it? Spice trade explorer? “Pollo” for chicken?) 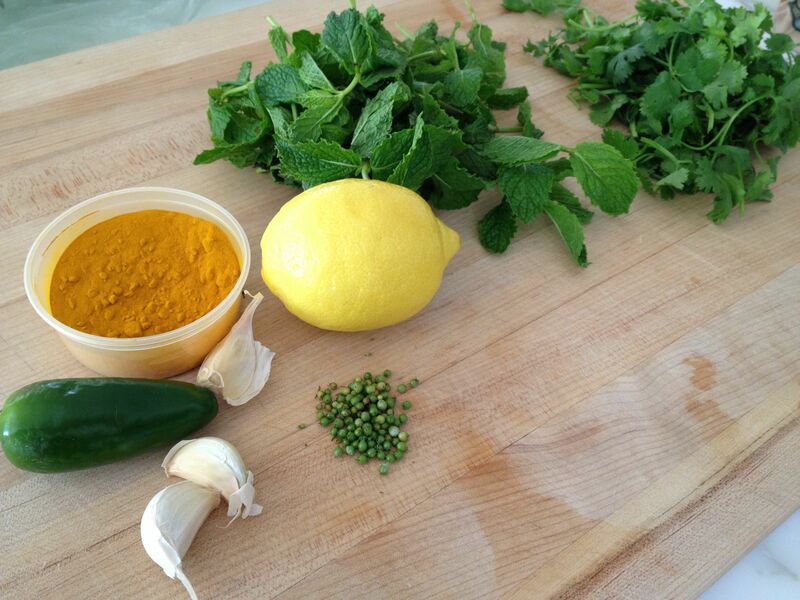 OK, so maybe not – but do Marco proud and try these unusual spices. 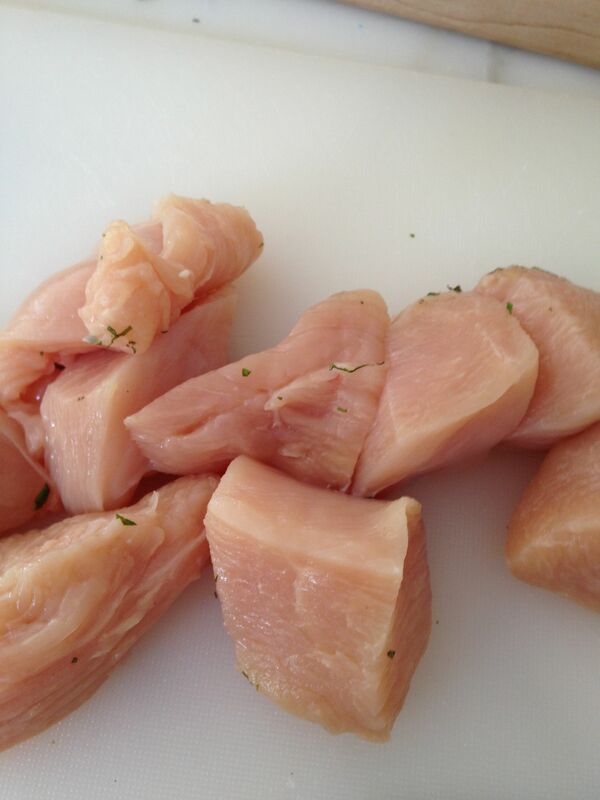 The chicken is most flavorful if allowed to marinate overnight, or even for a day or two. 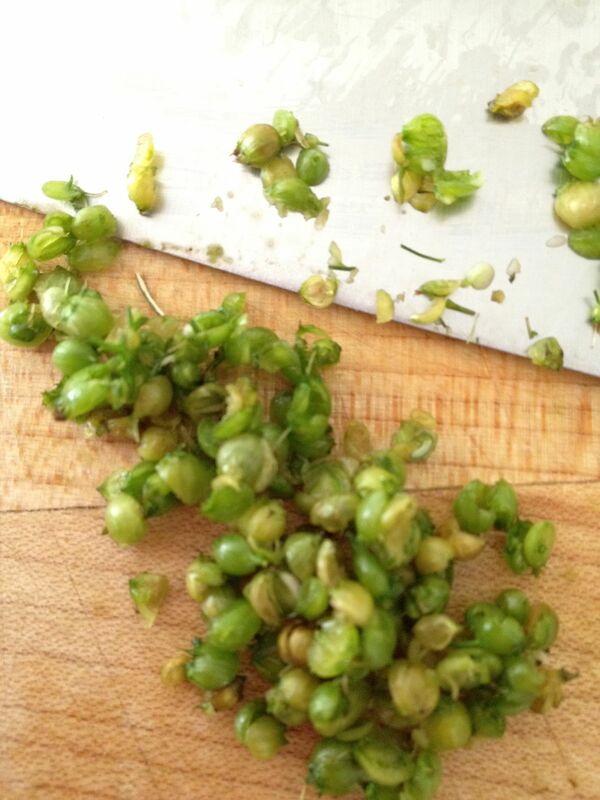 If you’re lucky enough to have some cilantro plants going to seed in your backyard, use the fresh green coriander (seeds) for even more flavor. Or if you just can’t bring yourself to purchase turmeric and coriander seeds for a recipe, leave them out. 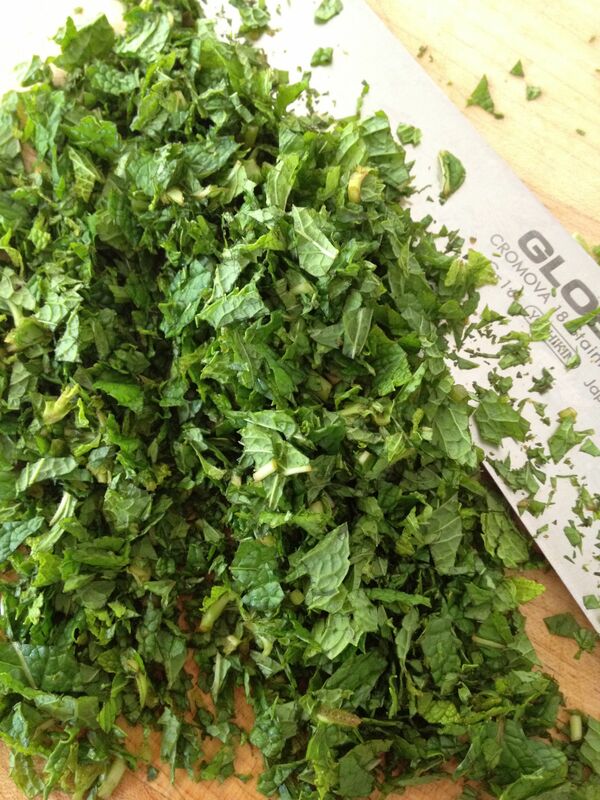 (In this case I’d add a teaspoon of ground cumin and/or chopped cilantro stems to the marinade instead.) And yes, this is YET ANOTHER application for my famous/infamous cilantro lime sauce. 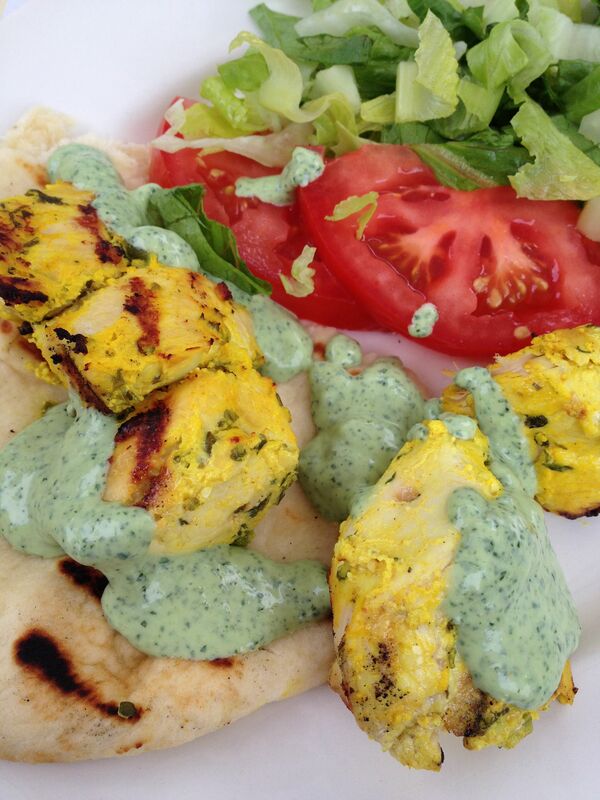 The yogurt marinade adds great flavor and helps keep the chicken moist (as long as you don’t overcook it), but a drizzle of cilantro sauce really makes the dish. This recipe serves 6-8, but don’t reduce the recipe if you have fewer people to feed – the leftovers make a great lunch salad. Chop up the chicken and add to chopped romaine; toss with leftover cilantro sauce as the dressing and top with crumbled pita chips, if desired. 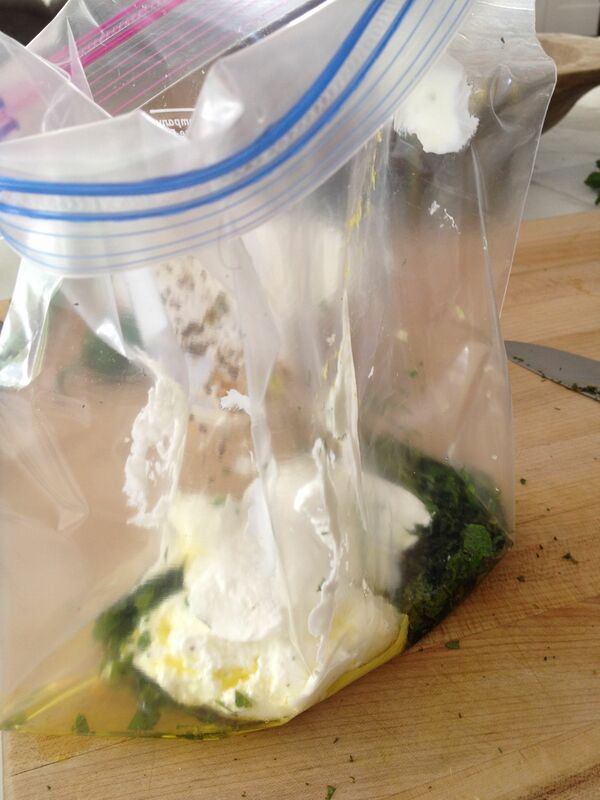 Add all the marinade ingredients to a large Ziplock bag. Squish to mix until combined and yellow (from the turmeric). Add chicken cubes and seal bag. 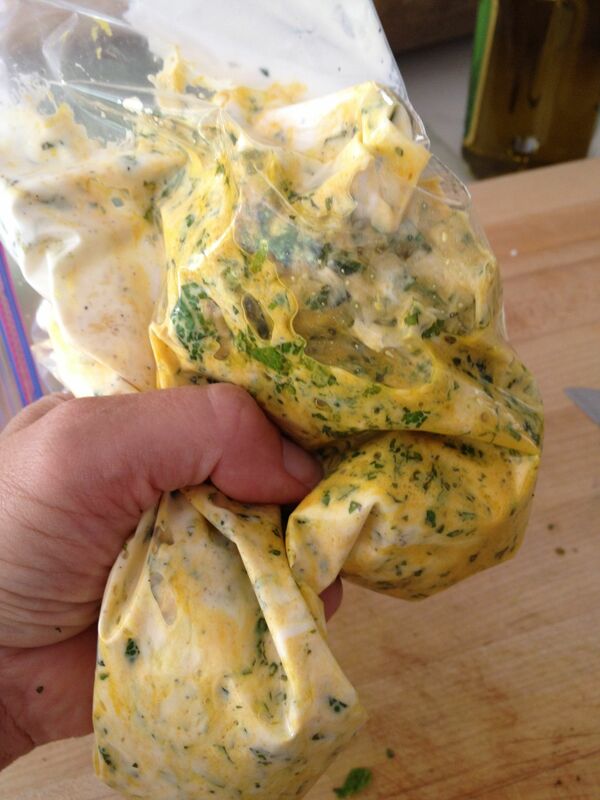 Refrigerate for several hours or up to 2 days. Look – no dishes to wash! 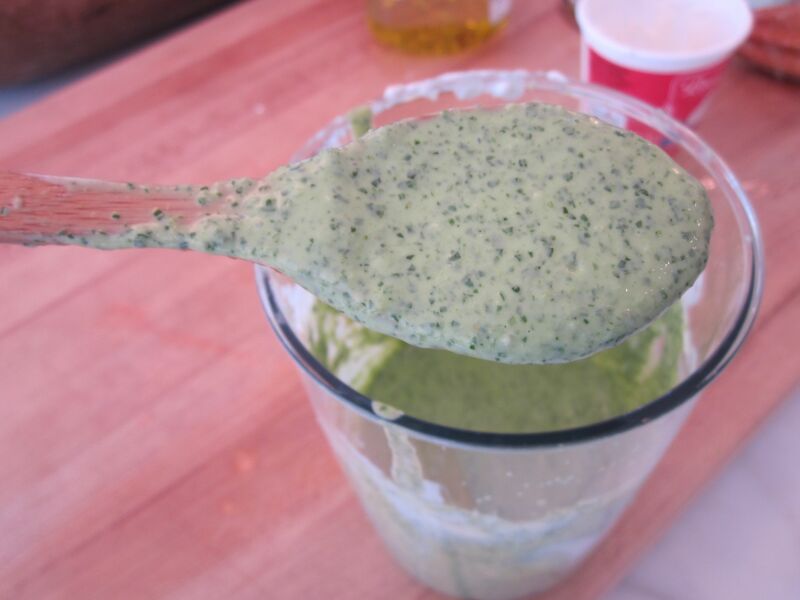 Add all sauce ingredients to food processor, or beaker if using stick (immersion) blender. Pulse and puree until smooth. (Add a little more olive oil to aid processing, if necessary.) 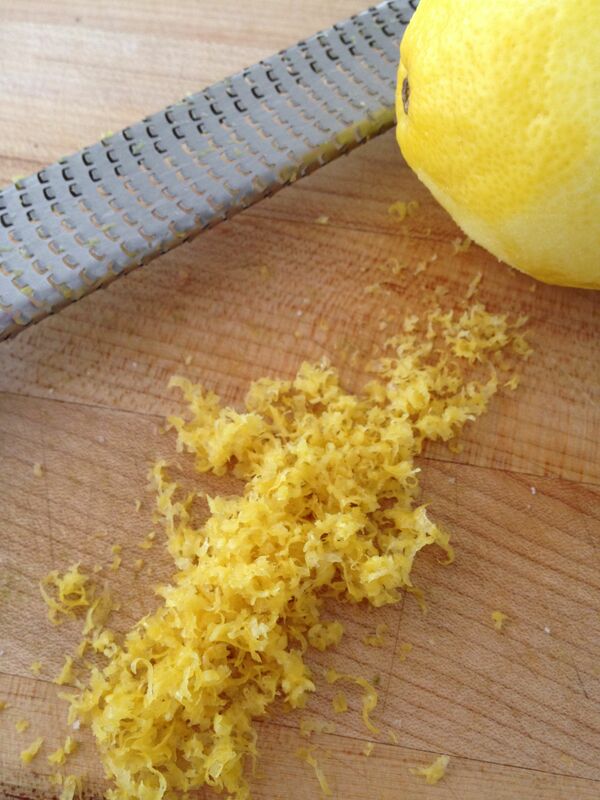 Adjust seasoning to taste (i.e., another pinch of salt or drop of agave/honey). Refrigerate until ready to use. 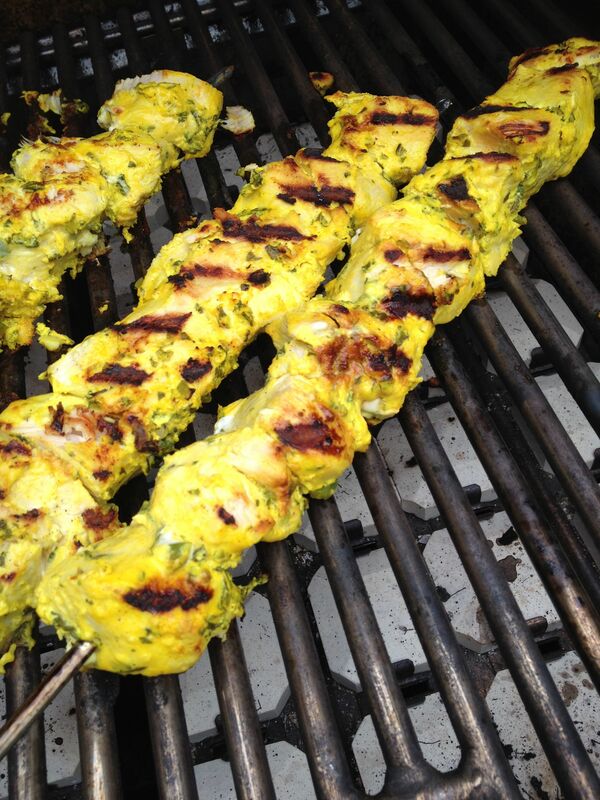 Remove the chicken cubes from marinade and thread onto skewers (metal or water-soaked bamboo). Heat a grill to medium-high or preheat a broiler. (To help prevent sticking, make sure grill grates are clean and oiled just before grilling – or, start out by cooking the skewers on a piece of foil for a few minutes; then slide them off onto the grill grates to finish.) Grill/broil for about 10 minutes total, turning a few times to ensure even cooking. 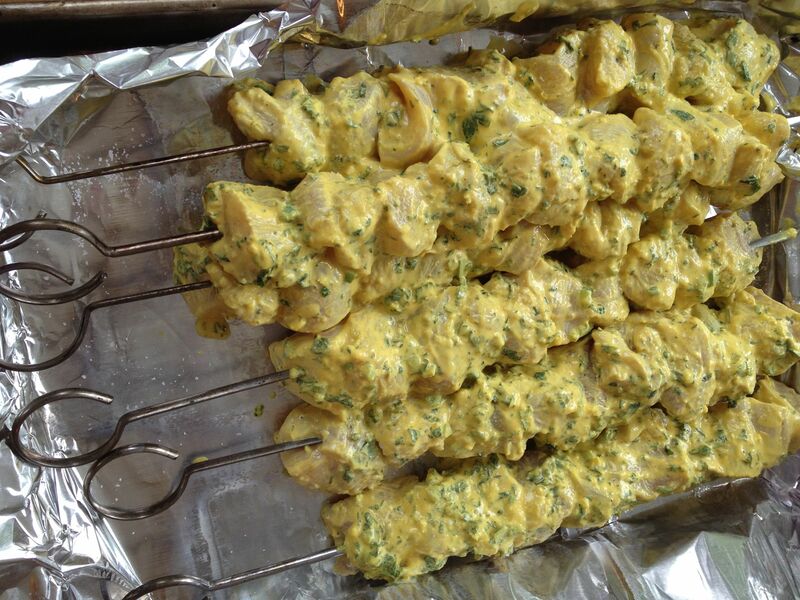 Push the chicken off the skewers (if desired) onto a serving platter. 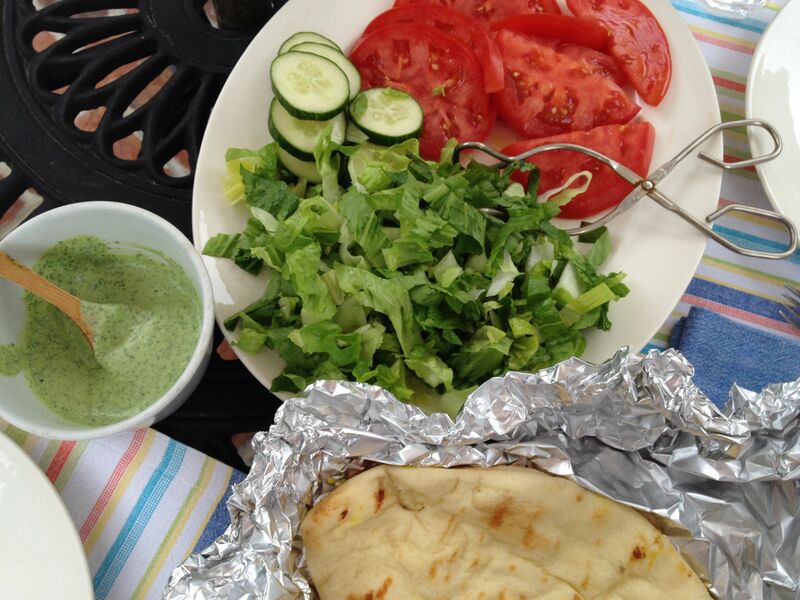 Pass chicken, warmed naan, shredded romaine, sliced tomatoes and cilantro sauce family-style so everyone can assemble their own “taco”. 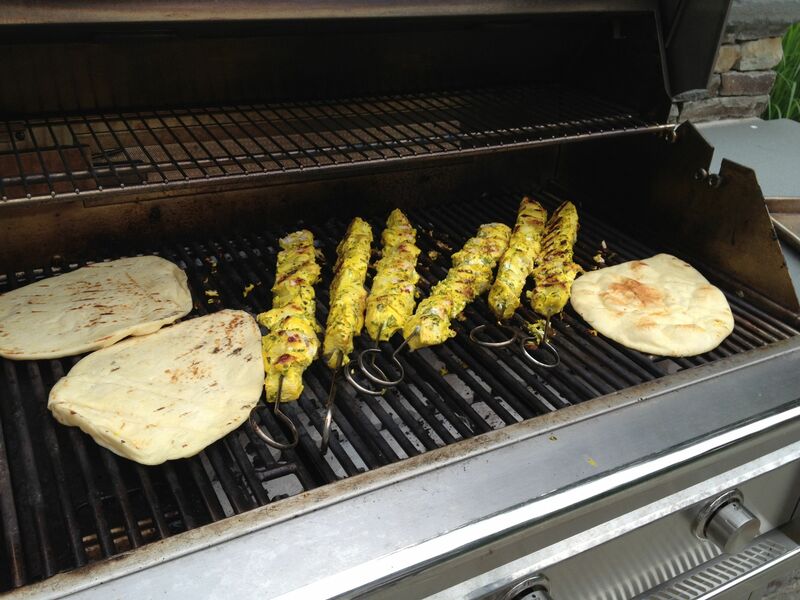 This entry was posted in Main Courses, On the Grill and tagged chicken marinade, cilantro sauce, coriander chicken, fresh coriander seeds, Mediterranean tacos, naan, souvlaki by subeeskitchen. Bookmark the permalink. I thought this post was really good ! 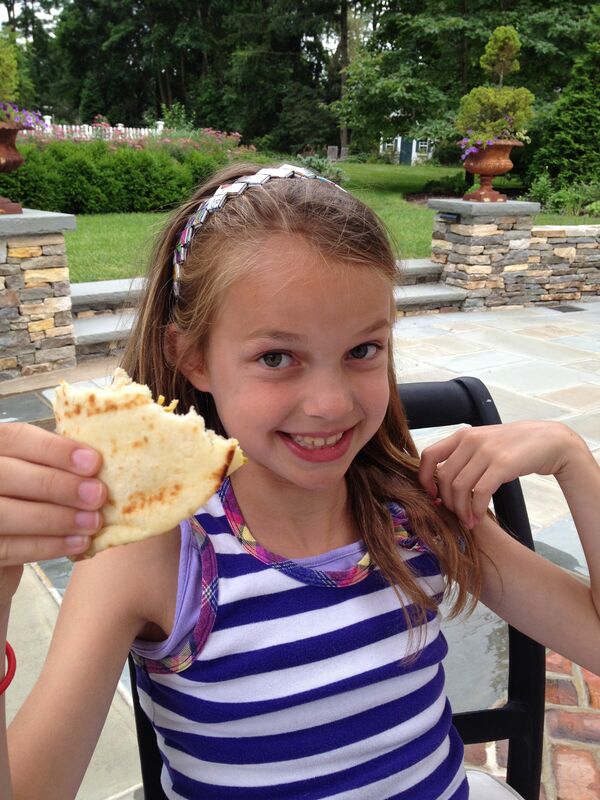 Your voyaging and Pollo puns – very nice ! Surprised I’m not seeing any other comments at my late arrival ! I’m really looking forward to trying this. While tempted to eliminate the mint (not my fave), I want to do Marco proud, so I’m sticking with it. I so wish I could get those seeds ! I’ll send you a picture of the mess I’ve got growing now – it’s really pitiful, but I do actually have seeds..they just unfortunately look nothing like yours ! Ironically, for years now, I’ve been growing my balcony boxes of corriander from the dried seeds you buy in the store !! I bought them for a recipe one time and wasn’t thrilled with what they were like in it, so I thought, what can I do with these ? Maybe I can grow them ? And with minimal effort, I did ! Happy 4th of July, Kitchen !